A Guest Post written by Keren Hannah Pryor and Cindy Lou, HIS-ISRAEL. ∼ Sukkot, the Feast of Tabernacles, occurs at the time “when the [Fall] harvest is gathered from the fields” (Exodus 23:16); thus, it also is called Chag Ha’Asif, the Festival of Ingathering. This can be understood on a natural, personal and historic level. In the physical world of nature, the crops that were tended during the hot summer months are now ready for harvest and the produce is gathered into storehouses or sold in the markets. On a wider, historic perspective, Sukkot represents the culmination of history, the end of time, when the full spiritual harvest will be gathered at the great and final Redemption. It will be the grand finale of the drama of history! (1) Building and living in a sukkah or booth: Leviticus 23:42-43; KJV: Ye shall dwell in booths seven days; all that are Israelites born shall dwell in booths:That your generations may know that I made the children of Israel to dwell in booths, when I brought them out of the land of Egypt: I am the Lord your God. and (3) Rejoicing during the Festival: Leviticus: 23:40b; KJV: and ye shall rejoice before the Lord your God seven days. ∼ The sukkah or booth is the most important and visible element of celebration, apparent in its name Sukkot (plural form of sukkah). 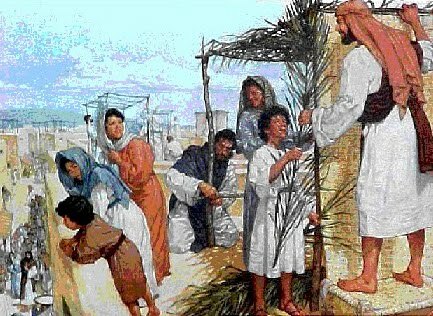 † The basic purpose of the sukkah is to remind us of the portability of the dwellings of the Israelites on their wilderness journey. Likewise, our lives are a journey and our security is not in the solid houses we build but in the One who guides and provides for us every step of the way. We deeply consider the reality that, “In Him we live and move and have our being” (Acts 17:28). The temporary, fragile sukkah thus depicts the nature of our lives. Life on this earth is impermanent and frail, it has a time limit. Like the sukkah, if the weather is sunny and pleasant we feel happy and sheltered. How suddenly this changes if the wind starts to blow, clouds build and a storm closes in to spoil our sukkah or, if severe enough, causes it to collapse altogether. Like the sukkah, our physical lives are fragile and fleeting; our goals and focus, however, are upon the infinite and the eternal. 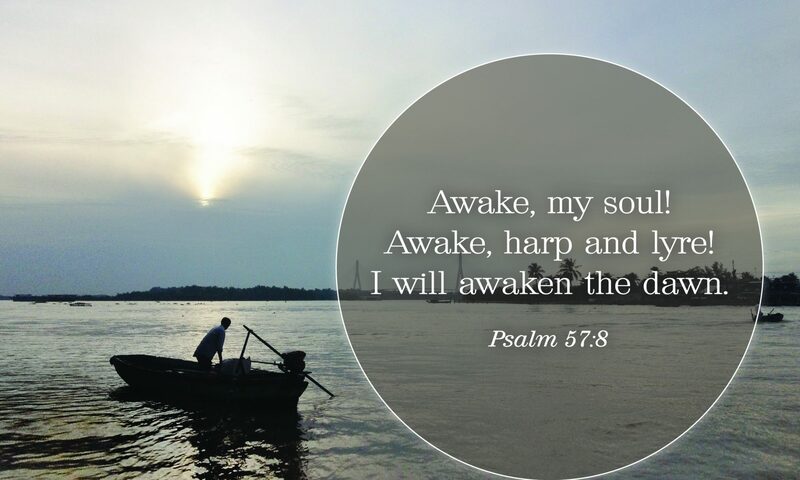 Our true home is in the endless Presence of the Creator of all. ∼ Season of Rejoicing: Z’man Simchateinu: Sukkot is associated with beauty, life and joy. It is the only appointed festival upon which God commands us to be joyful. “You shall rejoice before the Eternal, your God, seven days” (Leviticus 22:40). Our Father designed the earthly sukka, or tent, of our body and did not intend that our existence be a vale of tears. Through the trials and sufferings the world brings, He is with us and the faithful promises of His Word enable us to view life in a cheerful and optimistic light. When our hope and trust are in Him, we truly can “Rejoice in the Lord always!” (Philippians 4:4). 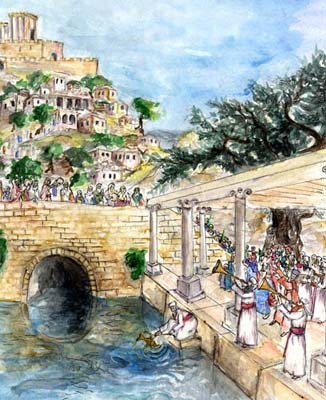 ‘Water- Drawing’ ceremony at the Pool of Siloam. After the sukkah, the most visible elements associated with the celebration of the festival of Sukkot in the land of Israel are the Arba Minim, the Four Species related to the Land and fruitfulness. While the sukkah is a reminder of the temporary nature of our journey and the need for God’s supernatural provision and protection in the wilderness, the four species are related to settled productivity. Deuteronomy 8:6-9: Therefore thou shalt keep the commandments of the Lord thy God, to walk in his ways, and to fear him. For the Lord thy God bringeth thee into a good land, a land of brooks of water, of fountains and depths that spring out of valleys and hills; A land of wheat, and barley, and vines, and fig trees, and pomegranates; a land of oil olive, and honey; A land wherein thou shalt eat bread without scarceness, thou shalt not lack any thing in it; a land whose stones are iron, and out of whose hills thou mayest dig brass. ∼ There are seven species specifically connected with the Land of Israel. These are wheat, barley, grapes, figs, pomegranates, olives and dates. The successful growth of each of these crops is also dependent on the weather patterns and the provision and timing of the seasonal rainfall. As these are in the hands of the Creator, prayers are said at the end of Sukkot for His timely provision of rain. The prophet Zechariah also makes a millennial connection with the Feast and rain: “And if any of the families of the earth do not go up to Jerusalem to worship the King, the Lord of Hosts, there will be no rain upon them” (Zechariah 14:17). The Four Species – Palm frond, myrtle and willow branches and an etrog. Customarily in Israel today, the particular four species gathered together for Sukkot are: the lulav (an unopened palm branch), hadassim (three myrtle branches), aravot (two willow branches), and the etrog (the citron). The branches are placed together in a special holder of woven palm fronds and are held together with the etrog when praying special prayers. † During the forty year journey through the wilderness, palm trees would have been a most welcome sight to the Israelites. Their tall, waving branches signaled water and a place to settle and rest from their travels. The tree God chose to adorn the walls of His Temple were palm trees, indicating the place that contained the resting place of His Presence and the ‘living water’ of His Word – the oasis of our strength and sustenance. The hadassim, myrtle branches, have shining, green leaves that are shaped like eyes. They remind us that we are to guard our eyes, for what we focus on and see with our eyes will inform our minds and hearts. We should regularly keep them fixed on His Word in order to study, to gain understanding, and to grow in healthy and holy relationship with Him and with one another. The aravot, willow branches, have leaves in the shape of lips, the gates of our speech. Often this is an area of greatest weakness. The willow tree needs much water to stay healthy and strong; our minds, that inform our speech and the use of our tongue, likewise need to be constantly strengthened and refreshed with the living water of the Word. When our lips are yielded to our Father then our words, which represent our attitudes and thoughts, will be filled with His praises and will speak His words of love and truth. The etrog is considered to be the pri etz hadar, the fruit of goodly trees, as listed in Leviticus 23: 40. The word hadar means ‘that which dwells’; thus the fruit is interpreted to be fruit that dwells continuously all year on the tree. It implies permanence, similar to the English word, ‘endure’. The etrog (citron) tree fulfils this requirement of constant dwelling, for most other fruits are seasonal but the etrog blossoms and produces fruit throughout all the seasons. It stubbornly perseveres in the heat and the cold, in wind and storm. It endures! This persistence adds depth to its beauty. The fragrant etrog has the shape of a heart, indicating the organ that maintains our life; and which represents the very place of our Savior and Lord’s life in us. With His Spirit of Holiness indwelling and empowering us, we can persevere through life’s difficulties, we can proclaim the victory of life over death, and celebrate the promise and hope of an eternity in the glorious Presence of God. The etrog also has the shape of a flame, a symbol of God’s Word and His Spirit. May His Word indeed be written on our hearts by His Spirit of holiness; then they will be purified like gold and we will shine for His glory! Joyful Dwelling: The sukkah reminds us of God’s commitment and devotion to us and how we are encircled by the “clouds of glory” of His protection and Presence. The portable nature of the sukkah points to the desire of God to dwell among us as His people. Immediately after Moses descended from Sinai bearing God’s atonement and forgiveness for the sin of the Golden Calf and the second set of stone tablets engraved with His Words – the symbol of His lasting covenant with His people – He instructed the building of His sukkah, the Mishkan, or Tabernacle (Exodus 25:8). Every one that survives of all the nations that have come against Jerusalem shall go up year after year to worship the King, Adonai Tzevaot, the Lord of Hosts, and to keep the Feast of Tabernacles (Zechariah 14:16). What joy there will be when Christ Jesus will take up his throne in Jerusalem and “the knowledge of God will cover the earth as the waters cover the seabed” (Isaiah 11:9) and all nations shall rejoice together with Israel at the great and glorious Festival of Sukkot. HalleluYah!